Grease a square baking tin or tin of choice. Heat the sugar, water (250ml) and lemon juice over a medium heat until dissolved and boil for further 2 minutes. While the sugar heats bloom the gelatine in cold water. Mix the cornflour and 50ml of water until evenly mixed. Squeeze the excess water off the gelatine and add to the sugar syrup together with the mixture, stirring continuosly. Add the rose water, peppermint extract and 2 drops of red food colouring and strain through a sieve. 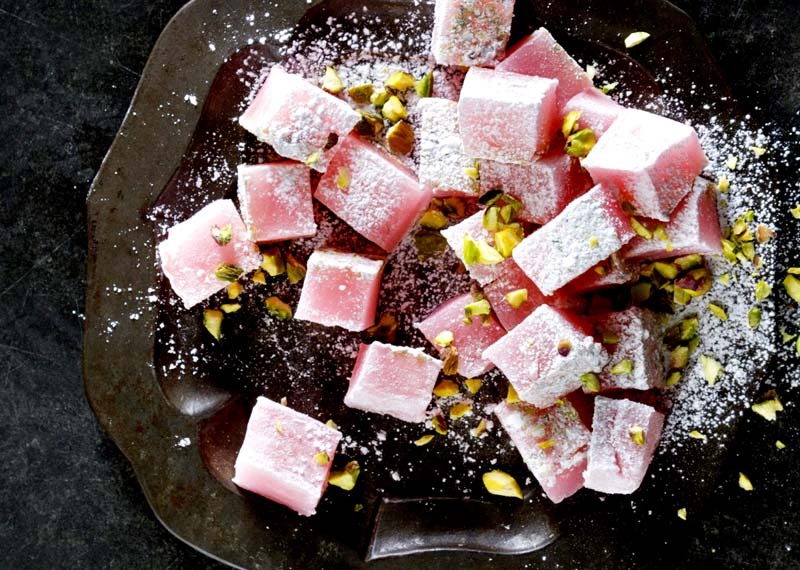 Pour into the baking tin and add pistachios, gently pushing them into the Turkish delight. Leave to set overnight in the refrigerator, cut into desired shapes and dust with cornflour and icing sugar.